Yay for those of you that actually got to scrap in December!! I love the way you each got your inspiration from this album cover in a different way! Great layouts by all 4 of you! Congratulations Donna! I have sent out your gift card! 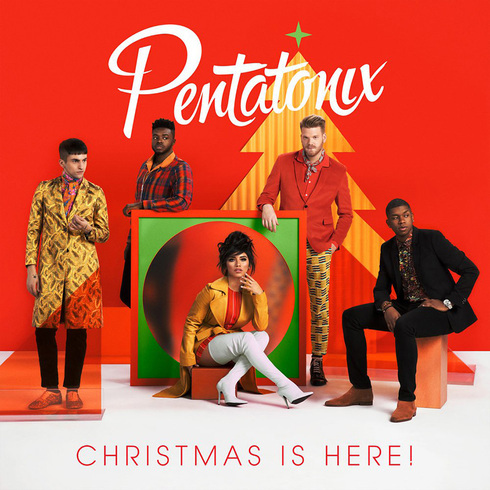 This month's challenge is to use this holiday album cover by Pentatonix for inspiration. Use anything about it, just let us know what it was that inspired you. You may even take your inspiration from the the title of the album. Open to paper, digi, hybrid, cards, crafts, or whatever this inspires you to create. Multiple submissions are allowed up to a limit of 5. I am going to extend this challenge since it is December and everyone is busy, busy, busy. I don't want anyone to be desperately scrapping on New Year's Eve to try and make the deadline lol. Post your submissions to this thread by midnight (whenever midnight is for you) January 6th. A random winner of all participants will receive a $5 ACOT GC from me! 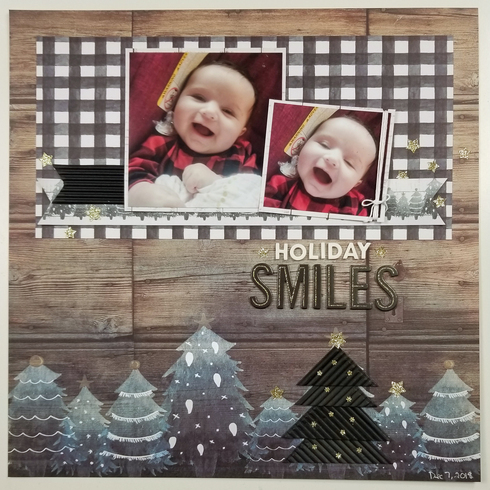 My layout is about my sweet baby JJ on her first Christmas last year. 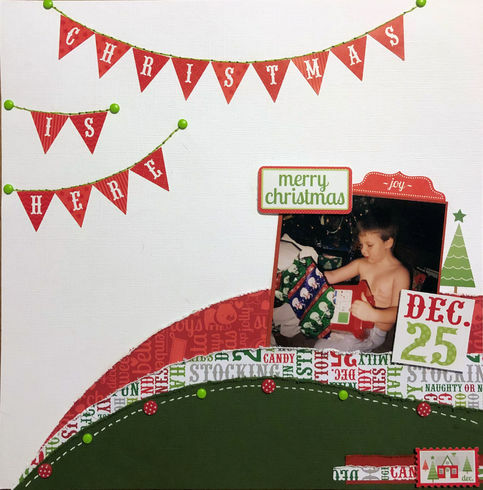 I was inspired by the big Christmas Tree shape, the circle inside the square, the colors, and the white title. Last edited by pawprints on Mon Jan 07, 2019 5:48 pm, edited 6 times in total. Great challenge inspiration and love that sweet example, Barb! The tree on the album cover looks corrugated to me so I made a tree using black corrugated paper. 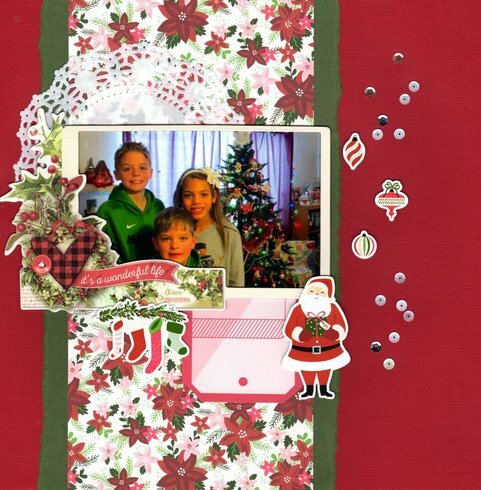 I'm also entering this in the Dec use your stash challenge and I scraplifted Deanna13 just for fun! Here's mine! I was inspired by the album theme, colors, and there's also a tree in my photo. 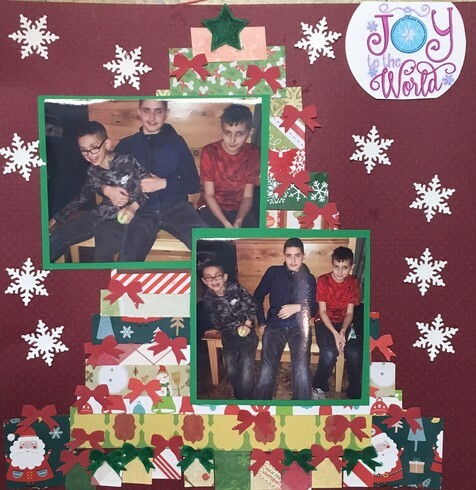 Photo of sweet grandkids Marcus, Lucy, and Kellan from Christmas 2017. For the Music Challenge I used the title from the Pentatonix album. Christmas Is Here. I was also inspired by the colors...reds, greens. I was inspired by the colors and the tree.